The transformative, yet oft-ignored jazz wizard Thelonius Monk is in the Google chair this week. Get better acquainted with genius, Daddy-o. “’Round Midnight” (1944) is easily the most well-known composition of American jazz pianist and composer Thelonious Monk (1917-1982). It’s also the most-recorded jazz standard written by a jazz musician, having been recorded by just about any jazz musician you care to name, too many to list here. One of the smoothest and loveliest performances comes from one of my favorite ever pianists, Oscar Peterson, accompanying the great Ella Fitzgerald. “’Round Midnight” is a beautiful melancholic melody, the gorgeous lyrics by Bernie Hanighen added later. This piece alone makes Monk a jazz legend. But wait, there’s more. How’s this? The most recorded jazz composer is Duke Ellington who wrote literally thousands of pieces. The second most recorded jazz composer is Thelonious Monk, who wrote around 70 pieces. That’s compelling endorsement of Monk’s compositional prowess and the enduring quality of his work. Thelonious Monk was born in 1917 and started playing piano at five, teaching himself to read music by watching his sister over her shoulder as she practiced. At 11 or 12, he began classical lessons; and he accompanied the choir at the local church. A keen listener, Thelonious made it his business to hear as many musicians as he could, including famous stride pianist James P. Johnson. It was obvious that music was his lot in life. In 1941, he began working at the now legendary Minton’s Playhouse in Harlem, and played an integral part in establishing the musical style that became known as bebop. We looked at Charlie Parker a while back; together with Parker, Dizzy Gillespie, Kenny Clarke, and others, Monk helped to give form to that exciting new genre. Monk wasn’t afraid to take risks. His works are notable for their dissonant elements, unusual rhythms, atypical harmonies. He was a bit introverted … a socially conscious man who supported various causes in his community. The thing is, Monk went beyond bebop, because he was interested in structure and not simply virtuosity. He developed a distinctive, rather percussive playing style, pausing during solos, flattening his fingers, sometimes using his elbows, and leaving out notes in chords. As Monk himself once said, “The piano ain’t got no wrong notes.” His playing style has had untold influence on countless jazz pianists ever since. It should be pointed out that Monk didn’t enjoy much critical or financial success during the 1940s or 1950s. His peers recognized his prodigious talent, but the public remained apathetic. His wife Nellie was his mainstay, both financially—she worked as a seamstress and also acted as his pseudo-manager—and emotionally. She was a devoted and caring partner. When it came to composing, Monk wasn’t afraid to take risks. A methodical composer, his works are notable for their dissonant elements, unusual rhythms, atypical harmonies. The compositions were sophisticated and out-there and he wasn’t taken seriously for a while. 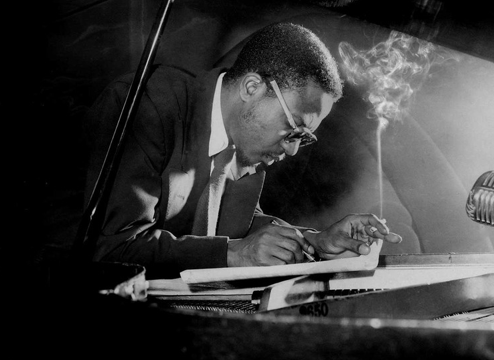 Jazz writer Scott Yanow comments that Monk’s music was essentially fully formed by 1947 and although he had little commercial success until the 1960s, he didn’t feel the need to change the way he played or composed. He just had to ride it out and stay true to his own vision. In 1956, Monk recorded Brilliant Corners, one of the seminal jazz albums of the 1950s. The title track, featuring Sonny Rollins (tenor sax), Ernie Henry (alto), Max Roach (drums), and Oscar Pettiford (bass), is particularly complex. Its unorthodox structure, unexpected time changes, and surprising rhythms made it a challenge to record, needing something like 26 takes, but the result is stunning. It’s bold, adventurous, and innovative. It’s been called a work of brilliance. Brilliant Corners had a tremendous impact, and over the next few years, audiences came on board, finally appreciating the new elaborate dissonance he’d created. The word most often used in conjunction with Monk is “eccentric.” He was a bit introverted, wore crazy hats, and sometimes danced around on stage, so the epithet is not that surprising. Monk has been reported as being a recreational drug user, but according to his biographer, Robin Kelley, he was never an addict. In addition, it seems likely that he suffered bipolar disorder and was prescribed the wrong medications, something that may have contributed to his peculiar behavior. It’s fair to say that during the 1950s what was known about mental illness was somewhat limited. Yet the public persona didn’t necessarily match up with the real man, who was a happily married, hands-on father of two children, and a socially conscious man who supported various causes in his community. If he sometimes played up an oddball mannerism, perhaps he was mugging for the cameras. He had a family to support and records to sell. Speaking of records, Monk recorded with a veritable roll call of renowned musicians, including Coleman Hawkins, John Coltrane, Sonny Rollins, Max Roach, Philly Joe Jones, Art Blakey, Roy Haynes, Clark Terry, and Charlie Rouse. Thelonious Monk imbued jazz and modern music with more harmonic freedom and compositional license, making him one of the great musical innovators. The last few years of his life were dogged by ill health and he died of a stroke in 1982, aged 64. In 1986, the Thelonious Monk Institute of Jazz was established in Washington D.C. A school providing fee-free music education, one of its most significant activities is the annual International Jazz Competition, promoting the best talent from across the globe. The Institute aims to make jazz a global art form, bringing together people from all backgrounds. Monk’s singular musical legacy thus continues. I think he’d be pretty proud of that.